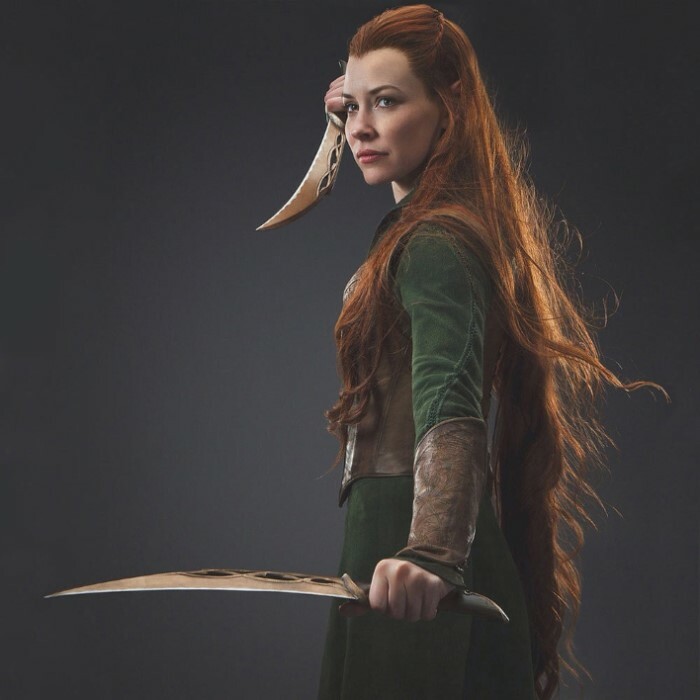 As Captain of the Woodland Guard, Tauriel carries signature twin daggers with blades forged of a bronzed alloy and a Silvan steel edge of superior strength. The hilts are crafted from greenwood with bronzed steel fi ttings. This replica is crafted of stainless steel with cast metal and polycarbonate handles, precisely detailed and colored to exactly match the movie prop. It is presented with a wood wall mount featuring a graphic motif, and includes a certificate of authenticity. Reading these reviews and seeing people disappointed, leaving comments like, non functional, cheap feeling handles etc....well folks, These knives are gorgeous. They are also replica weapons. No where have they been marketed as functional weapons. They are all wall hangers, every LOTR and the Hobbit replica weapon. As a fan, a very realistic fan of the films, the overall look is impressive. 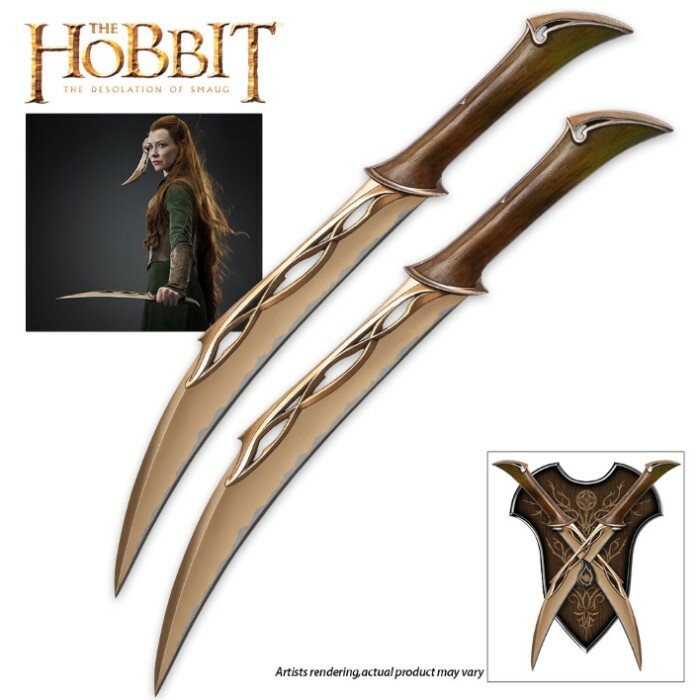 Do I plan on running through the woods in some bad cosplay outfit pretending to be an elf fighting imaginary orcs? Not hardly. Just plan on enjoying these and all the other movie replicas I have. Got these on the mystery deal sale. They look good, but when you hold them, the charm is gone. The handle material feels light and cheaply made, and the blades you can tell are cast metal. For what these are, a wallhanger to look at, they are fine. These knives are great for decoration. They look good and are nice reproductions. If you just want them to hang on the wall, then they are very nice. If, like me, you expect functional knives, there is a disappointment. For reasons I cannot understand the knives do not have an edge. The points of the knives are very sharp! Why the manufacturer decided not to add an edge is beyond me. After all, they are real knives, and as mentioned the tips are very sharp. Can I add an edge? Yes. However, If I decide to sell them in the future I would probably decrease their value by adding the edge. The knives can't be used for cosplay because I can't imagine any conventions allowing real weapons to be carried in. Before buying the knives I read that the handles are polycarbonate (basically molded plastic). I understand why the manufacturer decided to use that material because wood would be very difficult to form around the shape of the handle. Nevertheless, when holding the knives, the plastic really takes away from the charm of the design. Wooden handles would have lent a more natural and authentic "Elven" feel. As a decoration it doesn't matter. From a distance the handles look good. Overall, I am mostly pleased with the product, especially for the price I paid on BudK! 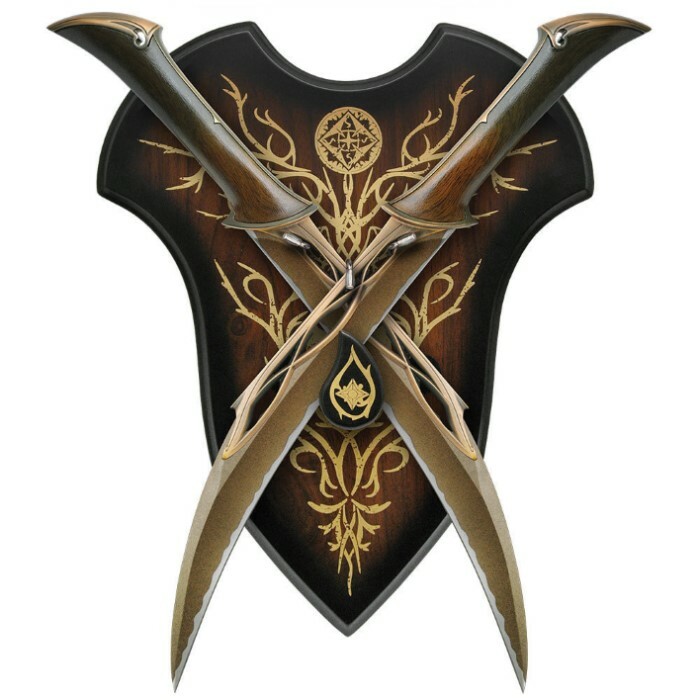 These are the best elven knives I have ever seen-beautifully designed-balanced perfectly for my hand. It will look great in my Hobbit/Lord of the Rings weapon collection-Thank you Bud K! Right out of the box they were larger and looked even better than they do in pictures. They feel great in hand and will look stunning on the wall. Happy to add them to my collection.